My sister, Becca, says I collect junk, but that's because, as a dealer in fine china and silver, she thinks anything that isn't bone china or silver is trash. It's true! Just ask her about my collection of Pyrex bowls, or vintage cookbooks. She doesn't get it. But I know from the growing number of dealers and collectors of vintage kitchen collectibles that I'm not alone here. We all have our favorites. Some folks love the feel and look of old linens. I quite agree. There is nothing more beautiful than vintage damask. The older stuff has a lux feel and weight that is just not matched by the new stuff. Others enjoy the look of vintage kitchen utensils. I'm with them! The old things are extremely functional, but I also like the colors; the cream and green painted bands, or smooth red of the handle... irreplaceable. Still others are fascinated by old cookbooks. Absolutely! The recipes in them tend to be quite utilitarian, but even more fun sometimes are the truly weird recipes you come across, like Stuffed Possum, or one I call Crown of Weenies, where you put hot dogs in a mould with Yorkshire pudding batter and bake. Hmm. Might be good, right? Or not. And old bowls... now you're talking my language. I love the look and feel of old Pyrex, the bright colors, the smooth feel. And I use them all the time, though I'm careful. No microwaves for the old things, you know, and hand washing only. I think we're beginning to see a theme here, and why my sister is cranky. My collecting has the vague overarching theme of 'kitchen stuff', but there is no one category. I want it all, and I think it contributes to a neat look in the kitchen, like time stopped sometime in the nineteen-fifties. All I need now is a Hoosier kitchen cabinet on which to display my vintage finds. I've got some estate sales and auctions lined up for May, and I hope I'll find THE thing, a real Hoosier. If I do, there is nothing stopping me from buying it, even if I have to bonk someone over the head to get it. That's not a threat, it's a promise... LOL. But don't tell Becca. She'll freak if she finds out I'm looking for that one big piece for the kitchen that will hold and display the rest of my stuff. So... do you collect? And if you do, is it in one specific area, or are you all over the map, like me? And what would you do to get that one special piece? From the author: As you can see by the book cover, Jaymie finds her Hoosier - among other things - and murder happens. 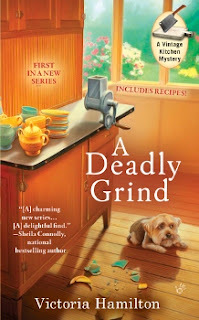 My release day is close - May 1st - and I'm excited for you all to learn what happens when Jaymie buys a bunch of her beloved 'junk' at auction in the first Vintage Kitchen Mystery! Read an excerpt on my website and watch my blog for release week fun! Welcome, Jaymie! Funny--your kitchen sounds like mine. I can't resist an interesting old bowl. And those Pyrex measuring cups with the "real" handles--I grab those whenever I see one, becaue the new handles are just too hard to hold (what idiot designed those?). Why do people design things to make them worse??? I agree. I like to rescue vintage embroidered linens and handknit sweaters from thrift shops. I love vintage linens... I have an old damask tablecloth I cherish. Sounds fun, Jaymie! Looking forward to reading it! I don't collect old, Jaymie except by accident (like in, don't get around to throwing things out). I do like egg cups though. Don't ask me why. The more unusual, the better. Can't wait to read all about it! Looove old egg cups! I have a couple of old bunny and chickie ones from when I was a kid and had to eat a soft boiled egg out of one - preferably the bunny - every Easter Sunday Morning! I have a vintage melamine set now that I use all the time. I collect angels, faeries, nutcrackers, nesting dolls and themed ornaments! Love faeries!! Sounds like a fun collection. Oooh, books! Who here doesn't collect books...? ;) And of course I love vintage of any kind!